You have to agree – sleep is very important, and if you don’t sleep well it can affect you in many different ways. Sometimes your mattress it at fault – it may still be nearly new but somehow doesn’t support your body as you would like – particularly if you a bad back, hips or other areas of your body are hurting in bed. What can you do? A memory foam mattress topper can enhance the support of your current mattress. But which one to buy? I have searched the internet and spent hours talking to people that use mattress toppers – even tried a few myself! I compiled a list of the best rated memory foam mattress toppers I could find, and cut that down to a shortlist of eight. I also compiled a buyer’s guide that explains why I recommend a memory foam mattress topper. The guide comes after the following memory foam mattress topper reviews. What is the best memory foam mattress topper for 2019? Here is my list of the top eight, followed by a description of each. Note: We are using the Queen size for our comparisons, though each of those listed is available in all popular mattress sizes. Memory foam mattress toppers can be used on foam and innerspring mattresses among others (see Buyer’s Guide below). Density in pounds stated only where available. 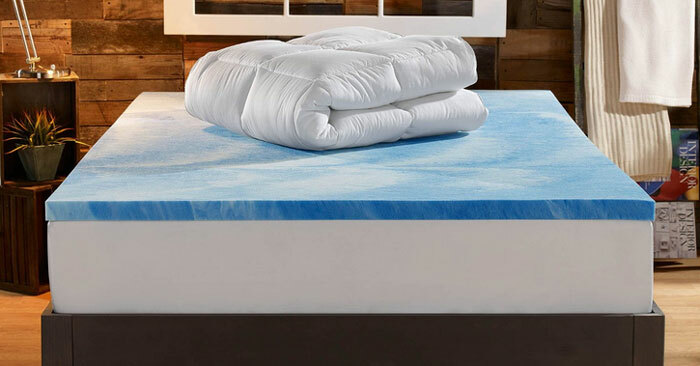 This comprises a 2” gel memory foam layer and a separate 2” plush soft down pillow top layer that can be used on top. The pillow top detracts somewhat from the memory foam affect, but provides a comfortable, soft sleeping surface with a 10 year limited warranty. Gets 85% 4–5 Star reviews. 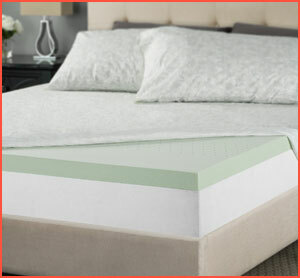 The memory foam offers support and helps prevent you waking in the night with a sore back or hips. The combination provides a cooling effect, so you don’t wake sweating in the night. It is a fairly soft combination, but offers good support. It comes with a cover that can be removed then washed and dried in a machine. This memory foam mattress topper is fairly heavy at 23 pounds, and the elderly may need some help to move and lay it properly on the bed. Some complain about sagging after a few months period of use. Check the terms of the warranty on this. Editors’ Note: This mattress topper combines the benefits of gel memory foam and the comfort of the soft down comfortable pillow top. It will suit most people looking for a softer, comfortable mattress topper incorporating the benefits of a thin layer of memory foam. This memory foam mattress topper comprises 3” gel memory foam. It has been designed with numerous small ventilation to maximize airflow and keep you cool when sleeping. It contains a special gel that traps the heat to keep you cool. At only 15 Lb weight, this mattress topper can be taken with you on vacation for use in hotels, where mattresses can often be thin with poor support. It is a soft memory foam, but supportive and pressure-relieving for those with a need for joint and back support. It helps to align your spine correctly and eliminate those pressure points that leave you feeling sore when you wake up. These are mainly in the hips, shoulders and sometimes the knees. Only 15 pounds weight, so suitable for traveling. Offers good support and pressure point relief. The design maximizes air flow, helping to maintain a comfortable sleeping temperature. Most of the few complaints refer to the topper being soft and sagging after a period of use. Warranty is 25 years, but read the details – there appear to be many disclaimers on it. Editor’s Note: Most users are happy with this mattress topper. While some comment on is softness, other state it to be medium firmness. Firmness or foam density is often a personal perception, and difficult to assess when the retailer does not state a density or hardness figure. Some say 3 lb density, though this is not stated on the website. 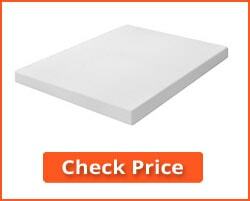 This 3” thick mattress topper comprises three inches of memory foam with medium hardness. It is ideal for laying on top of memory foam mattress that is either too sift or too hard for you. 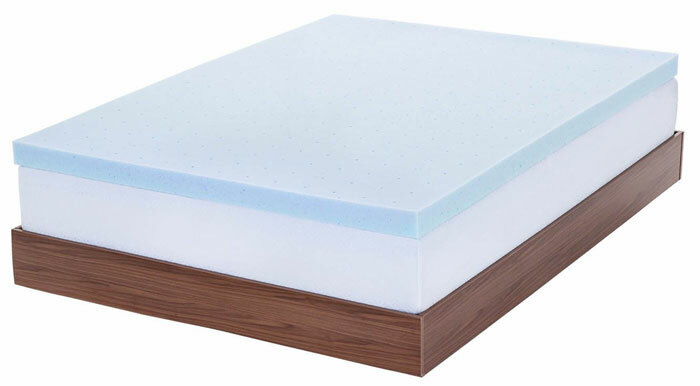 Like other toppers, it can he used on ordinary foam and innerspring mattresses to modify the comfort of the top sleeping surface. It is also good for covering small lumps and depressions in your current mattress. The iSocore 3.0 memory foam mattress is made by an American family firm, and is 100% viscoelastic memory foam that reduces pressure on your joints and pressure points by softening with your body heat. It meets all CPSC (Consumer Product Safety Commission) and EPA (Environmental Protection Agency) guidelines, so is safe for you and your family to use. 86% reviews with 4-5 stars. Only 4% of 1-star reviews. Soft and luxurious memory foam that molds to your body contours. 100% iSoCore 3.0 memory foam, offering an improved quality of sleep. Estimated weight by users is just 12 pounds – so good for travelling with. The limited warranty is only for 3 years. Most complaints referred to lack of comfort and life of memory function. Some complaints refer to inconsistent sizing – perhaps more care can be taken by this family business. Editor’s Note: This appears to be a very good mattress topper. Mattress topper technology is not easy to get just right because they should be neither too thin nor too thick. They are not mattresses and the iSocore mattress topper seems to have got the balance right. It may not top our list, but it certainly deserves to be among our top eight. This is a thinner 2” memory foam mattress topper, and its thin construction means that it is not as supportive as thicker toppers. Nevertheless, it is ideal to place on top of a mattress you are finding too hard for you. It is comfortable to lie on and promotes good sleep on top of an existing mattress . The foam used is Certi-Pur US certified and is made in the USA. This means that it is environmentally friendly, and contains no toxic materials. Its 12.6 pound weight is not excessive, and this topper is suitable for use when travelling. The gel swirl is cosmetic, and can look different in each mattress. Good level of hardness in a 2” topper. Light at 12.6 lb (5.7 kg) so good for travelling. Editor’s Note: This is a thin memory foam mattress topper than can soften a mattress that is too hard for you, or can level an existing mattress than is tending to sag or showing other signs of wear. 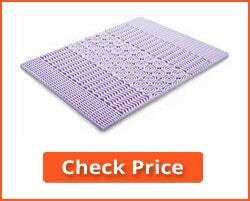 It cannot be used as a floor mattress, and cannot be used to rectify serious support defects in an old mattress. The Lucid 2-inch lavender topper has been constructed to help breathability, and is scented with lavender to provide you with a good, relaxing sleep. Each of the five zones is designed to relieve pressure at the five major pressure points of your body: ankles, knees, hips, shoulders and head. This level of support helps you feel more comfortable and the design of the foam helps you breathe better. Lavender is well known for its relaxing properties. However, it is still a two-inch thick topper, and the reduction in thickness tends to detract from its support properties. To be honest, some have also found that the thin foam tends to crumble or break apart after a relatively short period of time. Most 10% 1-2 stars referred to life – it tended to tear or crumble after a fairly short period of use (weeks – months, rather than years). However, most people loved it. Much of the lifetime issues may have been related to the way the topper was used. Almost 9 out of 10 people have been happy with their purchase, and give it a good review. Some commented positively on the weight: at just 8.9 lb, this is mattress topper easily transportable for use on vacation. Those requiring a comfortable sleeping surface for personal or orthopedic reasons can use this mattress topper on hotel beds. 85% of reviewers gave 4-5 stars. Lightweight, and so portable for use when visiting or on vacation. The lavender scent is relaxing and helps promote deep sleep. The texture pressure-point zones help to maximize support for those parts of your body requiring it. Thin and perhaps not good for everyone. Lifetime perhaps limited due to the lack of bulk in this mattress topper. Warranty is only 3 years. Editor’s Note: The LUCID 2” 5-Zone lavender memory foam mattress topper might be an excellent choice for those require support on the various pressure points of their body. Many require hip and shoulder support, which this provides. By laying this 2” thick topper on top of another mattress, you may also get back support if you need it. It is important your spine is well supported when sleeping. The lavender smell helps some but annoys others. At 3” thick, this memory foam mattress topper offers soft to medium support. Like many toppers, it is great if you have too hard a foam, memory foam or innerspring mattress and want to make it softer. This helps maintain the support of the underlying mattress, but provides you with a softer, more comfortable bed that still supports your weight and conforms to your body shape. It has been manufactured using a highly durable open cell structure. This not only allows the topper to breathe well, and so helps to keep you comfortable and cool in bed all night, but also helps the topper to retain its shape over a long period of time. The plant ingredients used in its manufacture also reduce its environmental impact. Good air flow within the mattress topper leading to a cooler and more comfortable sleep. Organic plant-derived ingredients minimize its environmental impact. Made in the USA using 100% memory foam. Limited warranty only 2 years. Some state that the quality has changed over the years, from a high to low-quality foam. Some complain about lifetime and its inability to smooth out the lumps or depressions in worn mattresses. Editor’s Note: It should be noted that mattress toppers are not intended for old worn-out mattresses. They cannot convert an old mattress into a new one. What they can do is to modify the level of hardness of existing mattresses of most types. 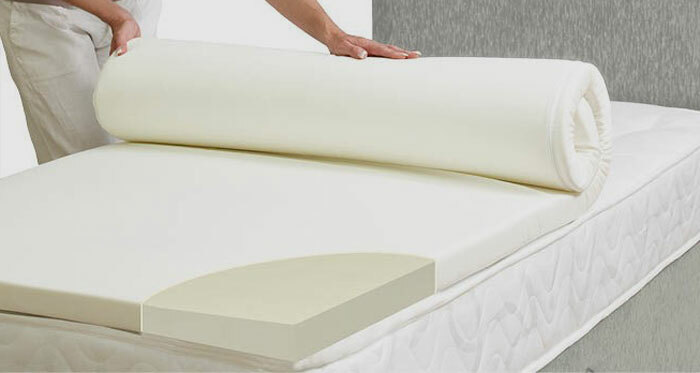 If you existing memory foam or innerspring mattress is too hard or too soft, you can modify it using a memory foam mattress topper of suitable density or hardness. This Authentic Comfort 3” topper does just that. You can also check out the 2” version of this mattress , the Sleepjoy 2” ViscO2 here. The Best Price 4-inch memory foam mattress topper is a standard memory foam topper that comes with zippered polyester mesh cover. The 4 inches comprises 2.5 inches of a high density foam plus 1.5 inches of memory foam. The memory foam lies on top of the regular foam. This type of mattress topper can work well if properly constructed. While 85% of reviewers were happy with this mattress topper, the other 15% were split between it being too soft and too hard. This may indicate a potential inconsistency in quality, although the terms ‘soft’ and hard’ are very subjective. What one person regards as soft may appear normal or hard to another. 85% reviewers gave 4-5 stars. It offers a more comfortable sleeping surface when placed on too hard a mattress, or one that has lost its flatness and is tending to sag. It comes with a protective zippered polyester mesh cover that most other memory foam mattress toppers do not have. The 5-year warranty is about average for a mattress topper. Some are much less. The 29 lb weight is a bit high for travelling with, considering the mattress has to be carried manually into hotels or other overnight accommodation. Many people using their mattress for orthopedic reasons may wish to do this. The memory foam effect is highly diluted, being only of 1.5 inches placed on top of a thicker regular foam layer. Editor’s Note: Although not our best rated memory foam mattress topper, this is a good standard mattress topper that many people use and like. Its greatest weakness in this category is its thin memory foam layer. It would likely figure highly in a review of mattress toppers in general, but the thin memory layer does not warrant a higher listing in my review. This mattress topper consists of 3 inches of 4-pound memory foam, and is slightly harder and more supportive than those above. It is comfortable to lie on and conforms perfectly to your body shape. If you are looking for a mattress topper that is not too soft or too hard then this is it. Although this will be suitable for most people, those that are heavier built might prefer something harder or denser for maximum support. It is made in the USA, and PURGreen certified, meaning that it has been manufactured free from ozone-depleting substances or unsafe materials. Like all memory foam toppers, this mattress topper can be used to instantly improve the support of a sagging mattress. 78% of reviewers gave 4-5 stars. Offers a medium firm top to your existing mattress. Memory foam manufactured without any toxic ingredients. Several negative reviews referred to a chemical smell, though this should dissipate after a day or two, although the company states that this is a new foam smell that is not harmful. There were some issues with cracking and short lifetime, although the majority of reviewers were happy with it. Fairly heavy at 33.3 lb rendering it perhaps unsuitable for travelling with. Limited Warranty only 3 years. Editor’s Note: The memory Foam Solutions Visco Elastic earns its place in our memory foam mattress topper reviews due to its 4 lb foam density offering a good level of support. Although comments have been made about the chemical smell of the foam, this is claimed to be normal and it dissipates shortly. While compiling these memory foam mattress topper reviews, it quickly became obvious that there is no general guidance on the information that manufacturers provide. Hardness and density are important properties of mattresses and mattress toppers, yet few manufacturers gave definitive figures for these important properties. 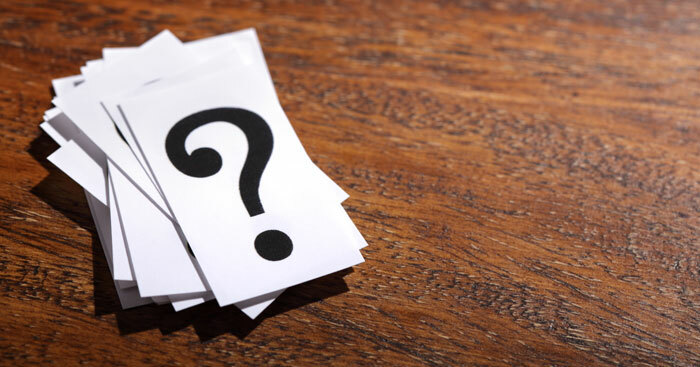 We are left to guess, or at best to find what we can from review sites that publish questions relating to these measurements and the answers provided by customers. Perhaps there should be more regulation, enabling prospective buyers to make an accurate comparison between the options available. That said, the Firmness and Density figures provided have been taken from the websites of the individual manufacturers and also comments made by customers who have purchased the Mattress toppers reviewed. If your mattress is too hard for you or if it is starting to show its age with small depressions, lumps and general inconsistency in the support it provides, then it can be freshened up using a mattress topper. 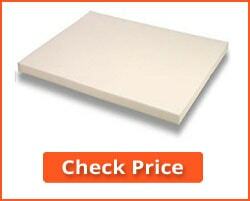 This is a thin 2-4 inch thick pad that can be placed on top of your original mattress. It completely changes the feel of your mattress, and can make a huge difference to your comfort both before and during sleep. However, if your mattress is sagging, then your topper will sag with it – sooner or later. Too hard of a mattress can lead to pain in your body’s pressure point’s, such as your hips, shoulders and knees. Too soft a mattress can fail to keep your spine properly supported and you may start to feel back pain. A mattress topper can prevent all of this happening, particularly if you use a memory foam mattress topper. If you have a bad back, then get as firm a memory foam mattress topper as you can. A density of 4-5 pounds is preferred, but if not then buy the firmest topper you can find. Few toppers will show the density on the website, and you may have to search online for third-party details of this for each mattress topper. Memory foam is a viscoelastic foam that can conform to the shape of your body. This level of elasticity is generally promoted by your body heat. When the memory foam becomes warmer through contact with your body, it softens and becomes viscoelastic. That means it flows slowly to match the pressure exerted on it by your body, particularly those parts of it exerting more pressure. That’s why it takes on the shape of your hips, elbows, knees and shoulders , and provides maximum support to those areas of your body. Many people purchase memory foam mattresses for this reason. They may have arthritis, where any pressure on the joints leads to pain. They may simply have big bones which tend to prevent them becoming comfortable though the night. Such mattresses do not last forever, and many tend to sag or begin to lose their ‘memory’ effect. They must then either be replaced or reinvigorated in some way. Check out our Memory Foam Mattress Review for more information on memory foam mattresses. A memory foam mattress topper can be used on top of an aging memory foam mattress to renew the above properties. 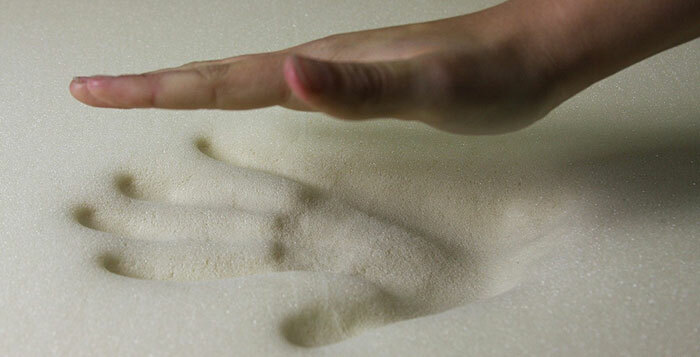 It can also be used on an innerspring or regular latex foam mattress to prove a ‘memory foam’ effect. Not only that, but if your existing mattress seems too hard for you, you will find that a memory foam mattress topper will soften the sleeping surface making it more comfortable. This is particularly true of the dual layer foams, which also offer a layer of soft down o top of the memory foam layer. Memory foams are what are known as viscoelastic. As it warms up, it starts to flow slightly and conform to those parts of your body that is heating it up. Your spine is kept straight while you sleep, even if your sleep on your side or your back. With side sleepers, your pressure points (shoulder, hip and any other prominent parts of your skeleton) sink into the warming memory foam and are then supported by it. A memory foam mattress topper works in exactly the same way, only there is thinner layer of it. You don’t necessarily have to purchase a memory foam topper of the same make as your mattress. In fact, you can use a topper on any brand and any type of mattress, although perhaps excluding a waterbed. Your existing memory foam mattress is too hard for you and you don’t feel comfortable on it. Your current memory foam mattress is aging and taking too long to return to a flat state. You have a spring mattress (continuous coils, open coils or pocketed coils) but want the memory foam effect. You have a latex foam mattress and want a memory foam top on it. You have a foam or innerspring mattress that is no longer comfortable due to lumps or sagging. 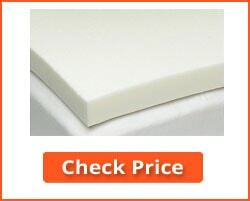 Go for a thin 2” memory foam topper. This will provide a softer base for you to like on while giving you the benefits of the memory foam properties. Examples are #4 and #5 above. In this case, you will likely require a thicker 3” or 4” mattress. You have a choice of 100% memory foam (#2, 3, 6 and 8 above). You could choose a dual layer mattress topper such as #1 and #7 that combines a memory foam layer and a soft comfort layer. These suggestions are not definitive, and you can select any topper you prefer. However, they do provide the optimum properties for your different needs. The firmer the mattress #2, 4 and 5 would be preferred if you prefer a softer bed to sleep on, while #3, 7 and 8 are best if you prefer a firmer base. #1 is somewhere between the two. Travelling: If you are travelling and want to take you mattress topper with you for use on hotel beds for example, then go for the lighter weight options such as #2, 3, 5 and 6. The others might be too heavy to carry from your vehicle to your room. It is not recommended to use even the best memory foam mattress toppers on the floor on the ground when camping. They are generally too thin to offer sufficient support when used without a regular bed base. Old Mattresses: A Mattress Topper should be not generally used on a old mattress that has lost its support and is extremely lumpy and virtually falling apart. You cannot fix such a mattress with only a topper. In fact, if you place a memory foam mattress topper on top of such a mattress it could give you skeletal and joint problems rather than help to cure them. Mattress topper memory foam layers tend to be thinner than in full mattresses, and do not offer the full and effective support that many people need. You often see mattresses graded in terms of their foam density and hardness/firmness. Unfortunately, manufacturers do not appear to consistently state the density of memory foam toppers, and refer to hardness simply as soft, medium or hard. This can be confusing to some people, although it is generally safe to purchase toppers based upon their thickness. For example, a firm 2” 3 lb mattress may be denser than a 2” 2 lb mattress, although you rarely find mattress toppers graded in this way on a manufacturer’s website. For that reason it is generally OK to purchase on the basis of thickness. There are far fewer thickness variations with toppers than with mattresses – 2, 3 and 4-inch are about it. What is the best memory foam mattress topper thickness? In fact, there is no ‘best’ because the optimum thickness depends upon your needs – what you need the mattress topper for. They usually come in 2, 3 and 4 inch thicknesses, though not all 4” mattress toppers consist of 4 inches of memory foam. Nevertheless, the following suggestions generally apply. A 2” memory foam topper will generally be fairly soft. A higher quality mattress topper may be slightly harder – soft to medium. If you have a fairly small build then this type of topper will likely be all you need. Many people use a 2-inch topper on top of a harder mattress that they find slightly too hard for maximum comfort. Do not use 2-inch toppers in an attempt to rectify an older mattress that may be lumpy or sagging in the middle. It will be too thin for this – you need something thicker. A 3” topper will have medium density and hardness, and will be suitable for most people. It is the most popular thickness. Although not as a good as new mattress, a new memory foam topper will improve the support to your joints, help keep your spine straight and provide you with an overall more comfortable sleep. A 3” mattress topper will generally be all memory foam, and can be used to cover up minor lumps and sagging in the mattress. If you are large built or ever 250 pounds in weight, then this is your best choice. This is true even though only half may be memory foam and half a comfort layer. 4” memory foams with a comfort layer, such as #1 and #7 above, are excellent for those who like the memory foam effect but prefer a top comfort layer with it. 4” toppers are also best for covering old mattresses with faults such as sagging and lumps – even though they are not recommended for use with very old damaged mattresses. Here are some of the more frequently asked questions of me regarding memory foam mattress toppers. 1. Is a memory foam topper OK to use if I have a bad back? Yes, but make sure it supports your back adequately. 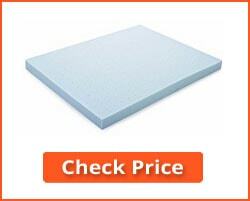 Try to find a thicker higher-density memory foam topper of around 4” thick and 4 – 5 pounds density. #7 or #8 in our list may do. 2. Can I put a memory foam mattress topper on top of my old mattress? Yes, but make sure your old mattress is still in reasonable condition. Putting a topper on top of an old badly sagged mattress will only result in the topper also sagging. It will cover up a degree of lumpiness and sagging, and make sure that the poorer condition your old mattress is in, then the thicker and denser your mattress topper should be. Toppers are ideal for softening a hard mattress and making it more comfortable, or you could put a denser memory foam topper on top of a mattress that feels too soft for you. 3. Can I lay a topper on the floor? It is possible to use a memory foam topper as a temporary bed on the floor. However, make sure it is at least 4” thick and not too soft. It is particularly suitable for children – older people may find it difficult to stand up from ground level! 4. Can I take my memory foam mattress topper with me to put on hotel beds or when camping?? Sure you can – they are ideal for taking on vacation. Some hotel beds are not too great, and a memory foam mattress topper is a good way to make sure you sleep well in a hotel or when camping. The only issue might be weight! The memory foam mattress toppers I reviewed have weighed from 33.3 pounds down to 8.9 pounds. It depends on how heavy a weight you can carry. 5. How long should my memory foam topper last? That depends on quality – quality and price tend to go hand in hand. A cheap mattress topper might last only 2-3 years, why a high quality topper may last 5 – 10 years depending on how you care for it. Turning it helps, and giving it a wipe down with a damp cloth will help it last longer. Also, the higher the density the longer it should last. A 4lb mattress topper should last longer than a 3 lb mattress topper for example. 6. Does a memory foam topper smell? Yes, it does to begin with. This is just the new foam releasing chemicals that will die down in a day or two, then the smell will disappear. This is common with most foam mattresses and toppers, not just memory foam. Yes – a thickness of 3” is average. You can use 2” for a slightly built person or 4” for somebody larger and heavier than average. Also go for 4” if you feel you need extra support. 8. Can I use an electric blanket? No – definitely not. An electric blanket will heat up the memory foam which will then become soft – likely too soft for use as a mattress. Memory foams work by softening through the heat of your body – so the areas of your body most in contact with the mattress (your pressure points) sink in and get better support. Many people might have an innerspring or latex foam mattress, and want to try the benefits of memory foam, or just try the memory foam experience. A memory foam topper is an ideal way to that at minimal cost, without going to the expense of a complete new mattress. Then again, somebody else may have a mattress that they feel is too hard for comfort, in which case a dual memory foam/comfort layer mattress topper might be ideal – #1 for example. I have checked out a large number of such mattress toppers and the above 8 are those I have chosen as representing the range available. I have selected a range of thicknesses from 2” through 3” to 4”, and also a range of densities/firmness. This best memory foam mattress topper 2019 review should give you a good idea about what memory foam mattress toppers are about, and what is available on the market for you to purchase. It is difficult to recommend a ‘best’ memory foam mattress, because each of the above offers advantages for different requirements. I have selected a range of thicknesses and densities using the Queen size as an example. It is important to understand that memory foam mattress toppers are not an answers to old worn mattresses, but can freshen up and rejuvenate mattresses that are still in reasonable condition. Very good article! I have been researching mattress toppers for my own problems, new mattress to soft/sinking. This article was full of knowledge, very insightful and a great read! Thanks for sharing your valuable experience. I am glad that you liked it. Thank you.